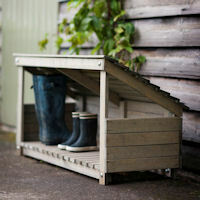 Spruce wood shelter to store your wellies and walking boots by the back door or next to the garden shed. Rustic storage crate on castors with room to store up to 3 pairs of wellies and 6 pairs of shoes, walking-boots, trainers etc. Delivered fully assembled. 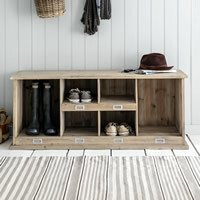 Spruce wood and zinc shoe / boot storage unit with 2 slatted shelves and 2 drawers. Ideal for use in the porch, hallway, bootroom etc. Rustic storage bench with room to store 2 pairs of wellies and 4 pairs of shoes, walking-boots, trainers etc. Delivered fully assembled. 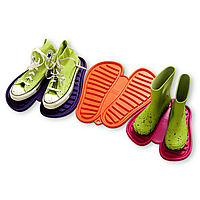 Flexible rubber shoe & boot drip mat to protect your floors from wet or muddy footwear. Fits up to a adults size 7 shoe/boot. 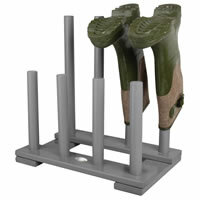 6 pair welly boot storage rack crafted from raw steel with a matt lacquer finish. Great for using by the door or in a utility / boot room. 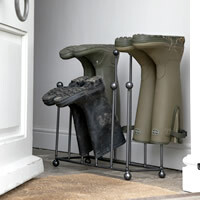 Store the families boots and wellies on our stylish grey wooden welly storage rack. A fab product at a great low STORE price. Flexible rubber shoe & boot drip mat to protect your floors from wet or muddy footwear. Fits adults shoes/boots from a size 7 to size 11 and are available in grey and lime green. Spruce wood storage locker with 4 cubbies for tidying away shoes and trainers plus 2 cubbies for wellies and boots. 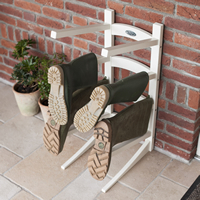 Ideal for using in the hallway, porch or boot room. 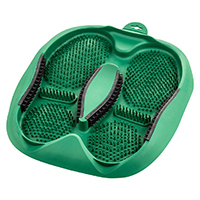 Robust plastic tray with a built-in scrubbing brush and tool to help extract your foot from your boots at the end of a long walk...Clever huh! 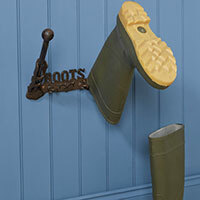 Cast iron wall mounted rack to air dry a pair of muddy boots by the front or back door. 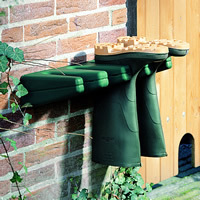 Store up to 4 pairs of wellies or walking boots by the front door or porch. 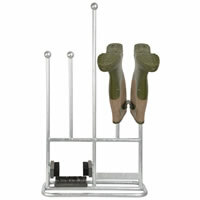 Has a handy shelf to steady you as you extract your feet! 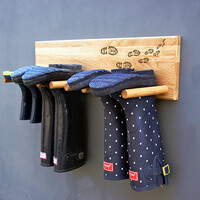 Store the families boots and wellies on our stylish cream wooden welly storage rack. 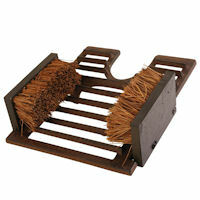 Traditional shoe / boot scraper to pop by the door for removing dirt and mud. 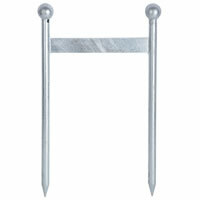 Modern reproduction of a traditional classic but in a weatherproof galvanised finish. 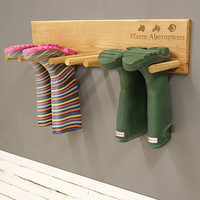 Solid oak wall mounted 4-pair Wellington boot store. Top quality and handmade in North Wales exclusively for STORE Personalise this welly rack with your family, farm or house name. 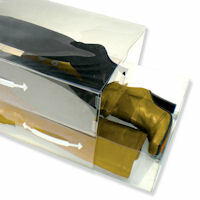 Set of two crystal clear stackable LONG boot boxes. Great for knee highs. Don't waste time with those fiddly shoe storage containers...Use our FABULOUS STACKABLE DRAWERS instead! Store 2 pairs of wellies or walking boots by the front door or porch. 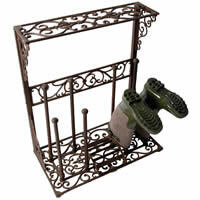 This rustic welly stand also has a handy shelf to steady you as you extract your feet! 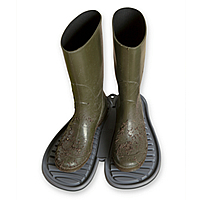 Flexible rubber shoe & boot drip mat to protect your floors from wet or muddy footwear. Fits up to a child's UK size 12 shoe. 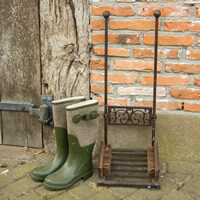 Cast iron boot rack with a scraper, 2 brushes and 2 handles to steady yourself when taking off your wellies. 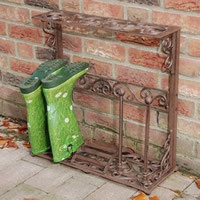 Contemporary galvanised boot rack with a scraper, 2 brushes, a handle to steady yourself when taking off your wellies and place to store 2 pairs. 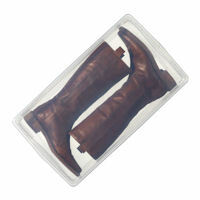 Set of two crystal clear stackable short boot boxes. Great for calf and ankle length boots. Don't waste time with those fiddly fold flat clear boot storage boxes...Use our FABULOUS STACKABLE DRAWERS instead! 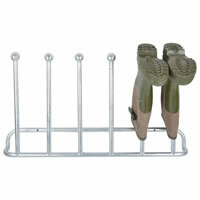 Wall mounted wellington boot storage rack to neatly store 2 pairs of muddy boots. New to our collection of shoe and boot storage solutions is this neat cast iron boot jack and brush from our friends in Germany. 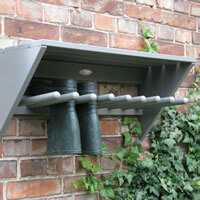 Galvanised wall mounted wellington boot rack to store 3 pairs of boots. 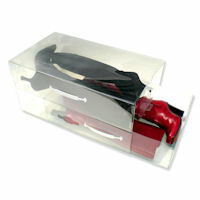 Cast iron boot jack to make extracting your feet from muddy shoes and boots easy. 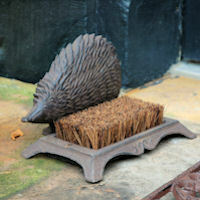 Clean your boots and Wellingtons with this sturdy metal hedgehog boot brush.